THE priest who once gave comfort to Kate and Gerry McCann has had his church stripped of all memories of their missing daughter. Father Jose Manuel Pacheco ordered the removal of scores of green and yellow ribbons which were put up as a symbol of hope in the days after Madeleine vanished. Posters and photographs of Madeleine which used to fill the windows of every restaurant, bar and business in the village of Praia da Luz have also been taken down. Residents of the Algarve resort are finally trying to move on from the tragedy more than seven months ago – and every trace of Madeleine has been wiped away. But the most devastating turnaround has come from Father Jose, the Roman Catholic priest whom the couple turned to in their hour of need. Friends fear for the priest’s health and tell how his life has been ruined after he offered the couple solace. Father Jose, 46, came under police scrutiny after he gave the couple the keys to his church so they could pray round the clock. He was questioned twice by detectives, and the church and its grounds were searched by police as they followed up leads into possible hiding places for Madeleine’s body. Investigators became convinced Kate had confessed to him – but the tormented priest insisted he would stand by his vow to take the secrets of the confessional to the grave. He was given a dressing-down by his superior, Algarve Bishop Manuel Quintas, and allegedly tried to shift the focus on to worshippers who had advised him to provide the McCanns with all the help he could. 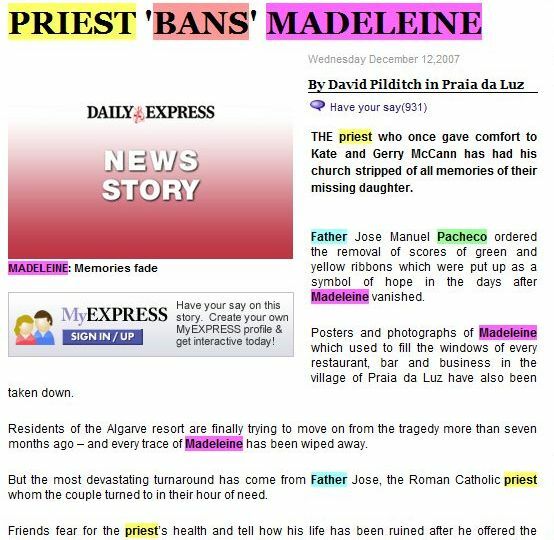 In the days after Madeleine went missing, locals flocked to the church to show their support for the McCanns. They laid a sea of floral tributes outside, while pictures of Madeleine and messages of support were pinned to the wooden doors. Now all that is left are two faded green ribbons – the symbol of hope in Portugal – still tied to the noticeboard outside the church. 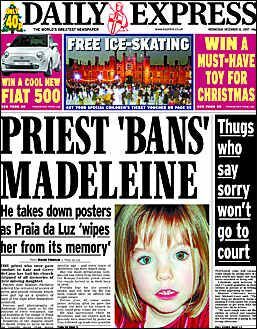 Last night a close friend of the priest told the Daily Express: “Father Jose can’t even hear the Madeleine case mentioned without becoming irate. “Even his closest friends must tread carefully when dealing with anything connected to the McCanns. When they broach the subject he immediately changes it. “He says that it is an extremely unpleasant situation and that the McCann family only ever brought him problems. He told one friend they ruined his life. 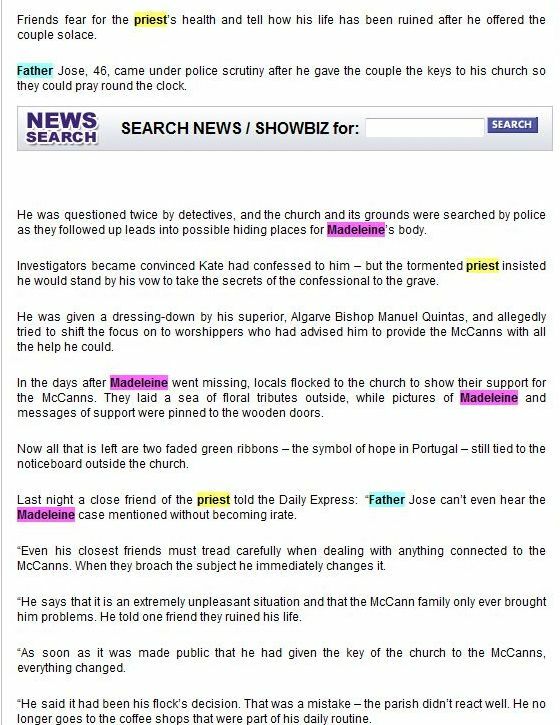 “As soon as it was made public that he had given the key of the church to the McCanns, everything changed. “He said it had been his flock’s decision. That was a mistake – the parish didn’t react well. He no longer goes to the coffee shops that were part of his daily routine. “He just wants to get on with his peaceful life before the McCann whirlwind raped his world. He just wants it all to go away. This has all been a very bad experience for him. Another friend said: “All this family brought him were problems. Talking about Madeleine is a sure way to spoil his day. There are two completely different Pachecos, the one before the McCanns and this shell of a man after the McCanns. Last night Father Jose refused to comment. 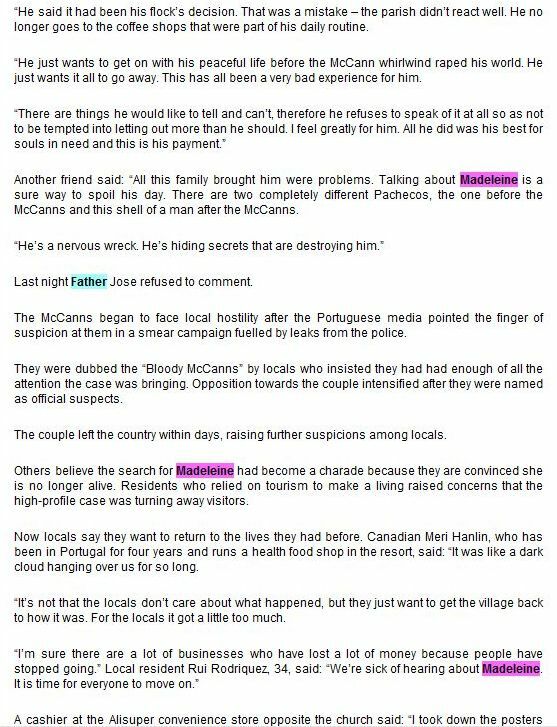 The McCanns began to face local hostility after the Portuguese media pointed the finger of suspicion at them in a smear campaign fuelled by leaks from the police. They were dubbed the “b****y McCanns” by locals who insisted they had had enough of all the attention the case was bringing. Opposition towards the couple intensified after they were named as official suspects. The couple left the country within days, raising further suspicions among locals. Others believe the search for Madeleine had become a charade because they are convinced she is no longer alive. Residents who relied on tourism to make a living raised concerns that the high-profile case was turning away visitors. Now locals say they want to return to the lives they had before. Canadian Meri Hanlin, who has been in Portugal for four years and runs a health food shop in the resort, said: “It was like a dark cloud hanging over us for so long. “It’s not that the locals don’t care about what happened, but they just want to get the village back to how it was. For the locals it got a little too much. A cashier at the Alisuper convenience store opposite the church said: “I took down the posters and I no longer wear the bracelet that the child’s father gave me. “It no longer makes sense to display symbols of the child’s disappearance when the parents are suspects.” Another shopkeeper said: “Opinions hardened when the McCanns went back to England and things have changed since then. It’s not just the Portuguese, the views of the English people also changed. 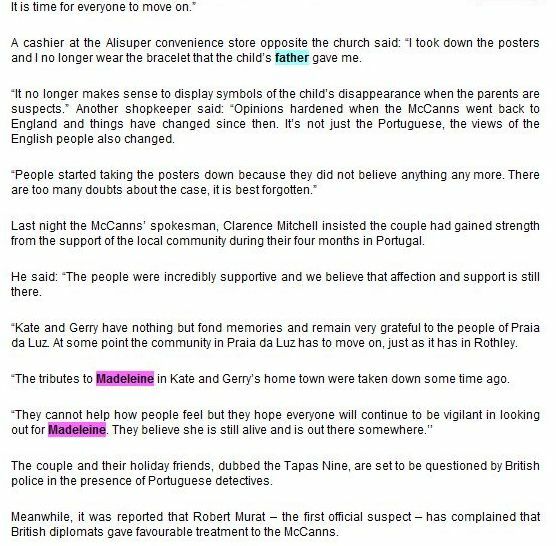 Last night the McCanns’ spokesman, Clarence Mitchell insisted the couple had gained strength from the support of the local community during their four months in Portugal. He said: “The people were incredibly supportive and we believe that affection and support is still there. “Kate and Gerry have nothing but fond memories and remain very grateful to the people of Praia da Luz. At some point the community in Praia da Luz has to move on, just as it has in Rothley. “The tributes to Madeleine in Kate and Gerry’s home town were taken down some time ago. The couple and their holiday friends, dubbed the Tapas Nine, are set to be questioned by British police in the presence of Portuguese detectives. Meanwhile, it was reported that Robert Murat – the first official suspect – has complained that British diplomats gave favourable treatment to the McCanns.